1 week ago today my little granddaughter was born, what more can a man ask for! 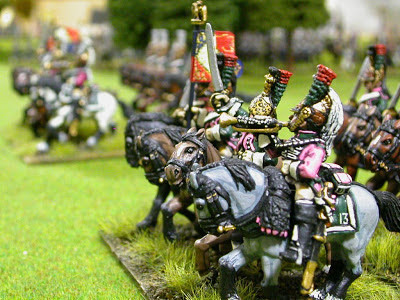 French Ligne of 2 battalions based for Empire V rules. 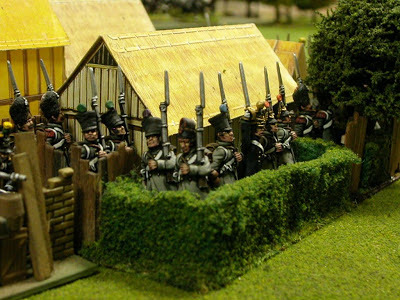 Part of a French brigade. These Old Garde are based for the Eylau demo game and also for 1814. 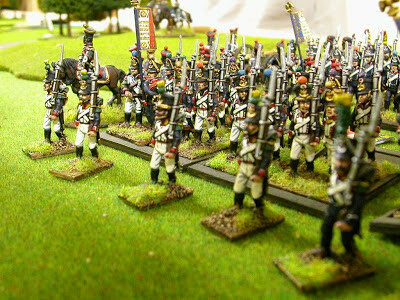 French Ligne regiment in campaign. 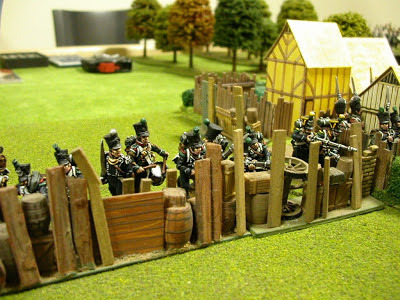 There's more pics of my French Armee on my mate Davids blogsite, http://wardepot.blogspot.com/. 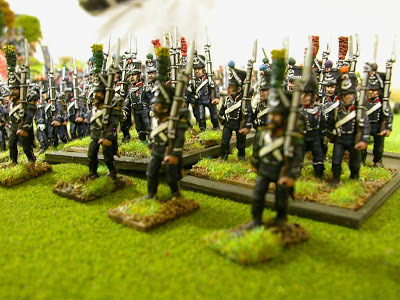 Currently my armee has 98 infantry battalions, 40 regiments of cavalry & 39 batteries of artillery + engineers, gendarmes etc. I hear what you're saying . . . . its not enough. As my good freind Dr Michael says; "you always need more". These are some of my Wargames Foundry Imperial Romans currently based for FOG. These are at least 10 years old and have been rebased 3 times. I haven't gamed with these chaps for may years, so its time to go back to my orignial basing system (6 x 2 man bases per cohort) dust off my Legio rules and invade someone. All of the shields are hand painted with head and weopon conversions throughout. Once again apologies for the wobbly pics. Close up of a Peter Connolly inspired shield design. 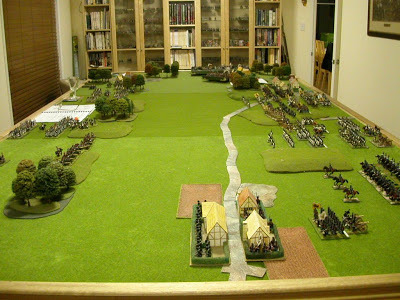 Here's some more of my extensively convered 1814 cavalry units. All the lances are hand made and shaped on my belt sander. The horses are from WF SYW range with horse furniture made from greenstuff. 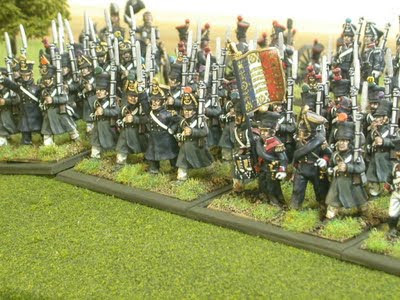 I used WF Austrian Uhlans for the troopers, adding pistols and french personal equipment. 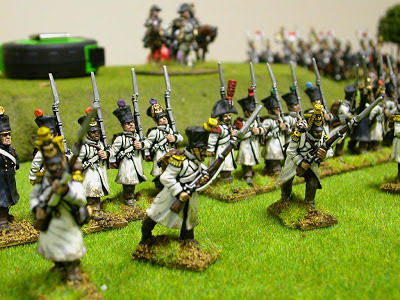 These nine figures make up the Provisional Carabineer brigade in my 1814 ordbat. These figures are also converted. I removed the original "box" Cuirassier portmanteau and replaced with the correct round portmanteau and cape, all made from greenstuff. I also removed and repinned the heads. 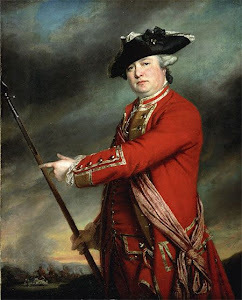 The officers horse was converted from WF Gren a Chev with the pistol covers resculpured to resemble black bearskin.